J Biol Chem 2014 289(38), 26155-66. OSU-03012 (AR-12) purchased from Selleck. The effect of specific PI3K (PF-04691502) or PDPK1 (OSU-03012) inhibitor on cell survival in MPM cell lines. (A) Six MPM cell lines and MeT-5A cells were seeded in 96-well plates (2.5 × 103 cells per well). On the following day, the cells were treated with the indicated concentrations (50 or 20, 10, 5, 2, 1, 0.5, 0.2, 0.1 and 0.01 μM) of Akt inhibitors (afuresertib, Akti-1/2, AZD5563, GSK690693, ipatasertib, TIC 10, perifosine, PHT427, and MK2206) for 72 h. The percentage of cell survival of 6 MPM cell lines were measured by MTT assay. Data are expressed relative to the mean optic density (550 nm) found in the untreated cells, which was arbitrarily defined as 100%. Data are expressed as the mean ± SE (n=3). Cancer Medicine, 2017, 6(11):2646-2659. OSU-03012 (AR-12) purchased from Selleck. (C) Orbital fibroblasts, in this case from a patient with TAO, were transfected with PDK1siRNA while fibrocytes were treated with OSU-03012 (5 mM) for 6 h. Cultures were treated as indicated (bTSH, 5 mIU/mL) for 30 min. Cellular protein was subjected to Western blot analysis of PKCm and pPKCm in fibroblasts (left panel) and PKCbII and pPKCbII in fibrocytes (right panel). (D) Confluent cultures were pre-treated without or with OSU-03012 (5 mM) for 6 h, then treated with nothing (control) or bTSH (5 mIU/ml) for 30 min. Cellular proteins were subjected to Western blot analysis probing with AKT and pAKT antibodies. Inhibition of TSH-dependent pAKT by OSU-03012 in 3 separate experiments was 14.461.2% and 2.560.6% in fibroblasts and fibrocytes, respectively. PLoS One 2013 8, e75100. OSU-03012 (AR-12) purchased from Selleck. 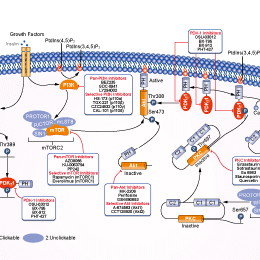 Apoptosis is detectable in OSU-03012-treated Eca-109 cells. After treatment with or without 2 umol/l OSU-03012 for 24 h, Eca-109 cells were fixed for the TUNEL assay ( x 200). 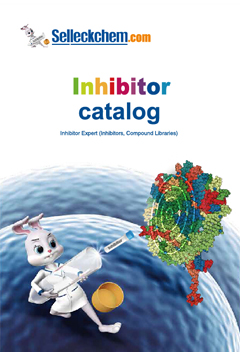 Anticancer Drugs 2013 24(7), 690-8. OSU-03012 (AR-12) purchased from Selleck. A derivative of celecoxib with 10-fold greater antitumor activity, but lacks celecoxib's COX-2 inhibitory activity. This in vitro assay is performed using a PDK-1 kinase assay kit. This cell-free assay is based on the ability of recombinant PDK-1, in the presence of DMSO vehicle or OSU-03012, to activate its downstream serum- and glucocorticoid-regulated kinase which, in turn, phosphorylates the Akt/serum- and glucocorticoid-regulated kinase-specific peptide substrate RPRAATF with [γ-32P]ATP. The 32P-phosphorylated peptide substrate is then separated from the residual [γ-32P]-ATP by using P81 phosphocellulose paper and quantitated in a scintillation counter after three washes with 0.75% phosphoric acid. Method: The effect of OSU-03012 on PC-3 cell viability is assessed by using the 3-(4,5-dimethylthiazol-2-yl)-2,5-diphenyl-2H-tetrazolium bromide assay in six replicates. Cells are grown in 10% FBS- supplemented RPMI 1640 in 96-well, flat-bottomed plates for 24 hours. They are exposed to various concentrations of OSU-03012 (0-10 μM) dissolved in DMSO (final concentration ≤0.1%) in 1% serum-containing RPMI 1640 for different time intervals (~72 hours). Controls receive DMSO vehicle at a concentration equal to that in OSU-03012-treated cells. The medium is removed and replaced by 200 μL of 0.5 mg/mL 3-(4,5-dimethylthiazol-2-yl)-2,5-diphenyl-2H-tetrazolium bromide in 10% FBS-containing RPMI 1640. The cells are incubated in the CO2 incubator at 37 °C for 2 hours. Supernatants are removed from the wells, and the reduced 3-(4,5-dimethylthiazol-2-yl)-2,5-diphenyl-2H-tetrazolium bromide dye is solubilized in 200 μL DMSO per well. Absorbance at 570 nm is determined by using a plate reader. Zhu J, et al. Cancer Res, 2004, 64(12), 4309-4318. Yacoub A, et al. Mol Pharmacol, 2006, 70(2), 589-603. Porchia LM, et al. Mol Pharmacol, 2007, 72(5), 1124-1131. Gao M, et al. Cancer Res, 2008, 68(22), 9348-9357. Tseng PH, et al. Blood, 2005, 105(10), 4021-4027. To K, et al. Mol Pharmacol, 2007, 72(3), 641-652. Lee TX, et al. Eur J Cancer, 2009, 45(9), 1709-1720.